CenturyLink customers joined Consumers Union’s End Robocalls team this morning to deliver a petition to the CL offices in Phoenix. Even though the FCC has said that landline operators can offer robocall-blocking technology to their customers, many of them have so far chosen to not do so. That’s why our colleagues at Consumers Union hand-delivered a petition with more than 500,000 signatures to CenturyLink this morning, hoping to drive home how fed-up consumers are with these unwanted interruptions. 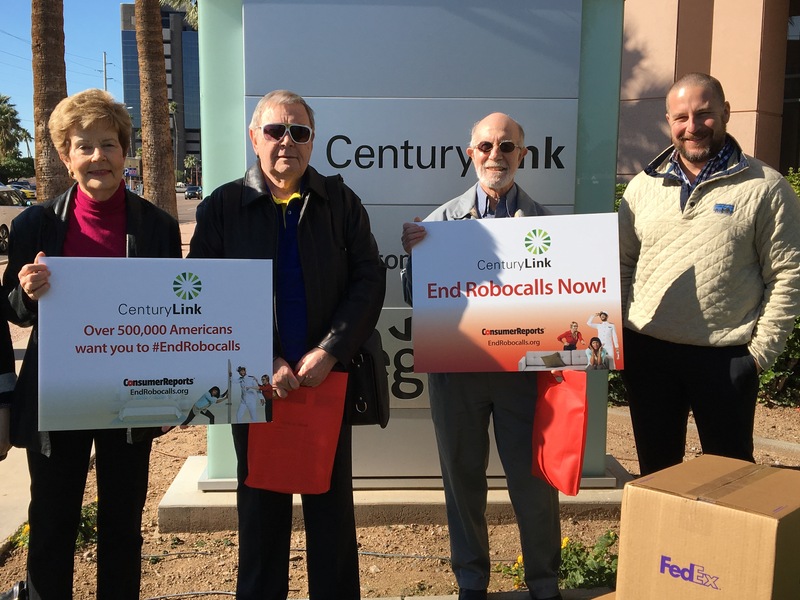 As part of its ongoing End Robocalls campaign, CU lugged its boxes and boxes of petition pages to the front door of CenturyLink’s office in Phoenix, one of the company’s largest markets, on Tuesday. “What we wanted to do is deliver a petition from over half a million people, calling on CenturyLink to provide customers with free and effective tools to end robocalls,” explained Tim Marvin, who has headed up the anti-robocall campaign for CU. more than 3.5 million complaints about these calls last year — and those are just the consumers who take the time to file a grievance with regulators. While the Do Not Call list and strict FCC rules prohibit many unwanted autodialed and/or pre-recorded calls, many robocallers are scammers who don’t care if they violate the rules. There are a number of options available to telecom companies to help consumers cut down on these phony phone calls, but the telecom industry has been dragging its feet in offering them. A frequently given explanation for the inaction is a concern that any sort of phone number blacklist may result in the occasional legitimate call being blocked. So instead, telephone companies have left it for the customer to use some third party device or service to moderate suspicious calls. Marvin said this isn’t about making call-blocking mandatory, but about giving consumers a simple option to rid themselves of these likely illegal nuisance calls. This is the second petition delivery for CU in recent weeks. The End Robocalls team knocked on the door of Verizon’s D.C. office a few weeks back, where the company agreed to sit down with CU to discuss the problem. The folks at AT&T HQ can expect to hear from consumers about robocalls in the coming weeks.